Simolestes vorax is an extinct pliosaur from the Middle Jurassic of England. Of all the reptiles that crawled, stomped, swam and flew their way through the Mesozoic era, plesiosaurs and pliosaurs have a unique distinction: practically no one insists that tyrannosaurs still roam the earth, but a vocal minority believes that some species of these "sea serpents" have survived down to the present day. However, this lunatic fringe doesn't include many respected biologists or paleontologists, as we'll see below. Plesiosaurs (Greek for "almost lizards") were large, long-necked, four-flippered marine reptiles that paddled their way through the oceans, lakes, rivers, and swamps of the Jurassic and Cretaceous periods. Confusingly, the name "plesiosaur" also encompasses the pliosaurs ("Pliocene lizards," even though they lived tens of millions of years before), which possessed more hydrodynamic bodies, with bigger heads and shorter necks. Even the biggest plesiosaurs (such as the 40-foot-long Elasmosaurus) were relatively gentle fish-feeders, but the largest pliosaurs (such as Liopleurodon) were every bit as dangerous as a Great White Shark. Despite their aquatic lifestyles, it's important to realize that plesiosaurs and pliosaurs were reptiles, and not fish--meaning they had to surface frequently to breathe air. What this implies, of course, is that these marine reptiles evolved from a terrestrial ancestor of the early Triassic period, almost certainly an archosaur. (Paleontologists disagree about the exact lineage, and it's possible that the plesiosaur body plan evolved convergently more than once.) Some experts think the earliest marine ancestors of the plesiosaurs were the nothosaurs, typified by the early Triassic Nothosaurus. As is often the case in nature, the plesiosaurs and pliosaurs of the late Jurassic and Cretaceous periods tended to be bigger than their early Jurassic cousins. 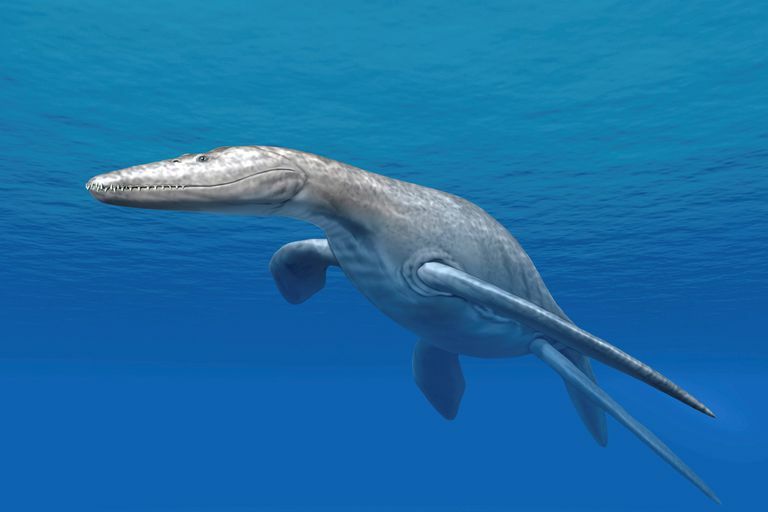 One of the earliest known plesiosaurs, Thalassiodracon, was only about six feet long; compare that to the 55-foot length of Mauisaurus, a plesiosaur of the late Cretaceous. Similarly, the early Jurassic pliosaur Rhomaleosaurus was "only" about 20 feet long, while the late Jurassic Liopleurodon attained lengths of 40 feet (and weighed in the neighborhood of 25 tons). However, not all pliosaurs were equally big: for example, the late Cretaceous Dolichorhynchops was a 17-foot-long runt (and may have subsisted on soft-bellied squids rather than more robust prehistoric fish). Just as plesiosaurs and pliosaurs (with some notable exceptions) differed in their basic body plans, they also differed in their behavior. For a long time, paleontologists were puzzled by the extremely long necks of some plesiosaurs, speculating that these reptiles held their heads high above the water (like swans) and dived them down to spear fish. It turns out, though, that the heads and necks of plesiosaurs weren't strong or flexible enough to be used this way, though they certainly would have combined to make an impressive underwater fishing apparatus. Despite their sleek bodies, plesiosaurs were far from the fastest marine reptiles of the Mesozoic Era (in a head-to-head match, most plesiosaurs would likely have been outflippered by most ichthyosaurs, the slightly earlier "fish lizards" that evolved hydrodynamic, tuna-like shapes). One of the developments that doomed the plesiosaurs of the late Cretaceous period was the evolution of faster, better-adapted fish, not to mention the evolution of more agile marine reptiles like mosasaurs. As a general rule, the pliosaurs of the late Jurassic and Cretaceous periods were bigger, stronger, and just plain meaner than their long-necked plesiosaur cousins. Genera like Kronosaurus and Cryptoclidus attained sizes comparable to modern grey whales, except that these predators were equipped with numerous, sharp teeth rather than plankton-scooping baleen. Whereas most plesiosaurs subsisted on fish, pliosaurs (like their underwater neighbors, the prehistoric sharks) probably fed on anything and everything that ventured their way, ranging from fish to squids to other marine reptiles. One of the odd things about plesiosaurs and pliosaurs pertains to the fact that, 100 million years ago, the distribution of the earth's oceans was much different than it is today. That's why new marine reptile fossils are constantly being discovered in such unlikely places as the American west and midwest, major portions of which were once covered by the broad, shallow Western Interior Sea. Plesiosaur and pliosaur fossils are also unusual in that, unlike those of terrestrial dinosaurs, they're often found in one, completely articulated piece (which may have something to do with the protective qualities of the silt at the ocean bottom). These remains baffled naturalists as long ago as the 18th century; one fossil of a long-necked plesiosaur prompted a (still unidentified) paleontologist to quip that it looked like "a snake threaded through the shell of a turtle." A plesiosaur fossil also figured in one of the most famous dust-ups in the history of paleontology. In 1868, the famous bone-hunter Edward Drinker Cope reassembled an Elasmosaurus skeleton with the head placed on the wrong end (to be fair, up to that point, paleontologists had never encountered such a long-necked marine reptile). This error was seized on by Cope's arch-rival Othniel C. Marsh, kicking off a long period of rivalry and sniping known as the "Bone Wars." Are Plesiosaurs and Pliosaurs Still Among Us? Even before a living coelacanth--a genus of prehistoric fish that was believed to have died off tens of millions of years ago--was found in 1938 off the coast of Africa, people known as cryptozoologists have speculated about whether all the plesiosaurs and pliosaurs really went extinct 65 million years ago along with their dinosaur cousins. Whereas any surviving terrestrial dinosaurs would likely have been discovered by now, the reasoning goes, the oceans are vast, dark and deep--so somewhere, somehow, a colony of Plesiosaurus might have survived. The poster lizard for living plesiosaurs, of course, is the mythical Loch Ness Monster--"pictures" of which bear a marked resemblance to Elasmosaurus. However, there are two problems with the theory that the Loch Ness monster is really a plesiosaur: first, as mentioned above, plesiosaurs breathe air, so the Loch Ness monster would have to emerge from the depths of its lake every ten minutes or so, which might draw some attention. And second, as also mentioned above, the necks of plesiosaurs simply weren't strong enough to allow them to strike a majestic, Loch Ness-like pose. Of course, as the saying goes, the absence of evidence is not evidence of absence. Vast regions of the world's oceans remain to be explored, and it doesn't defy belief (though it's still a very, very long shot) that a living plesiosaur may one day be scooped up in a fishing net. Just don't expect it to be found in Scotland, in the vicinity of a famous lake!